I am currently typing this log at 23:33 on Friday the 12th October. 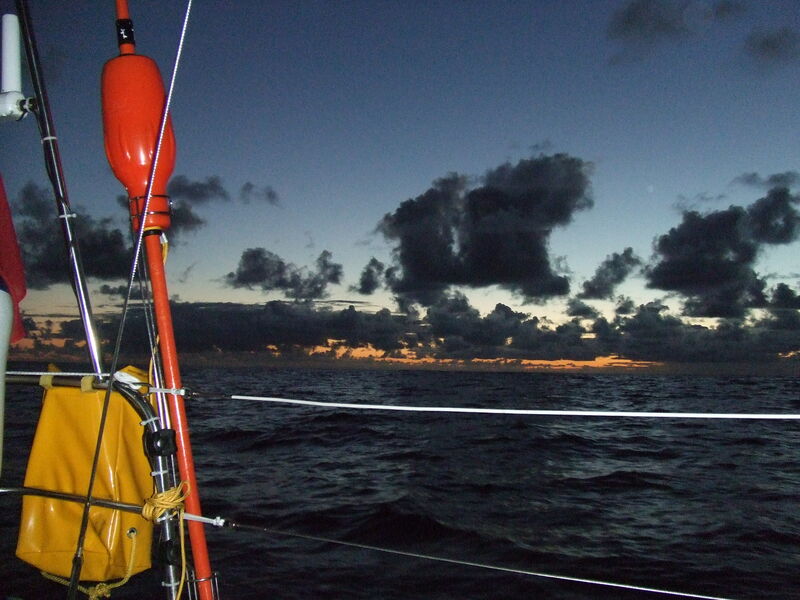 We are now 60 miles off the Portuguese coast heading 230 degrees magnetic. There is 4,300 meters of water beneath us and Madeira is 400 miles away. It is raining and visibility is poor. It is unfortunate that we are motoring but there is no wind and I already had a romantic notion not to use the engine and drift but after 3 hours of the sails flogging and drifting south we terminated this idea. Carlotta is now in bed and I am on watch until 02:00. We have just been visited by another Yacht called ‘Balance’, which was some entertainment. 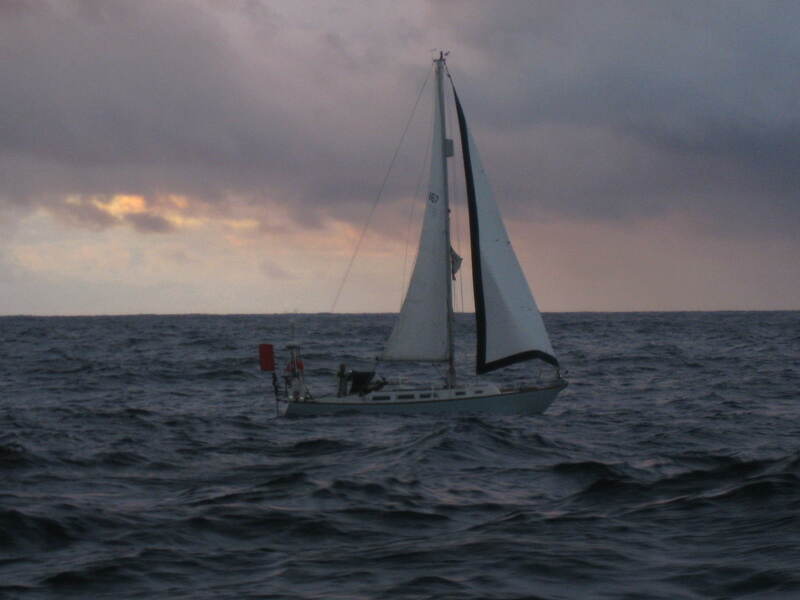 There are currently 3 yachts in convoy including ourselves although we do not know who they are. The good news is that I have managed to tune into the BBC World Service after hooking up my SB radio antenna to the spreaders and to top it off I have a bag of chewy fruity sweets so all is well. We had departed Cascais at 08:00 and have had a pretty uneventful day. 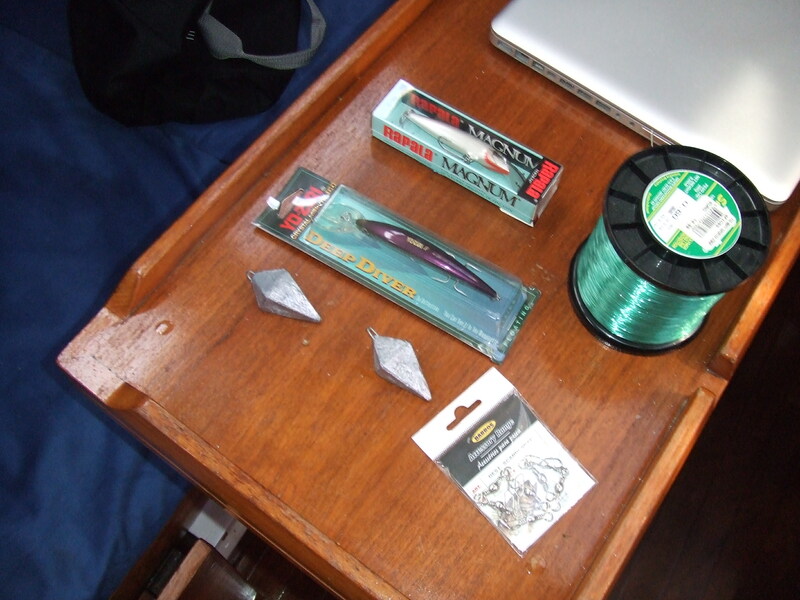 The fishing line is out but we have caught nothing yet. We had a lovely chicken Jalfarzi for lunch and will probably have the remainder on our change of shift. The lack of wind is so annoying and I can only hope it will pick up tomorrow to enable us to do some sailing. I am currently sitting with no wind in complete calm. The water is the deepest blue I ever experienced and the silence is absolute. we are drifting aimlessly with not a breath of air. I took the early morning watch but we were still motoring. 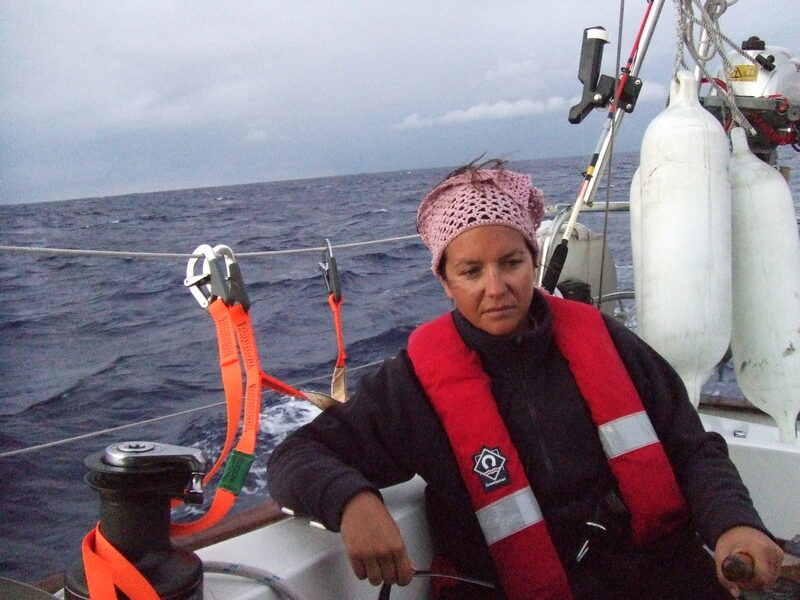 The concern that is playing on our minds is that if there continues to be no wind we do not have enough fuel to get to Madeira. We have completed 140 miles and only have enough fuel for another 265 miles, which leave us around 70 miles short. The swell is intolerable. It is like being on a heavy wash cycle in a Halmatic 3000, or what ever old washing machines are called. The sails are constantly flogging and although I have now pulled in the Genoa and prevented the main they continue to make bang every time a wave lifts us. On a good note we are still radio distance to yacht ‘Rafiki’ and ‘Spirit of Argo’ so have been having numerous talks with their children; Emily (aged 9) and James (aged 7). Spirit Of Argo have now caught two fish so the competition between Troskala and Rafiki is on. We had home-made pizza for lunch. At 14:00 the engine went on to try to stem the swell but it did not help much. I pulled down the main and polled out the Genoa but this did not help. No rain in the night and about the only exciting thing to happen was a close encounter with a tanker and some dolphins who came to visit in the early hours. I am getting much better at Pac-Man and have now read two books since leaving Cascais. Still no fish. We are still motoring. My concern about the lack of fuel is increasing. Now we have dropped behind the two other boats and lost radio signal. The wind is set to increase later on with force 5 Northerly predicted. It is difficult to adjust to not being in a rush and just letting the boat drift but this is our only option at the moment. As I type there is a squall to the north of us so hopefully we can get some speed up. It is currently 11:25 and we have covered 210 miles. We are nearly half way and expect to be in Porto Santo on Wednesday instead of Tuesday. We have enough food and water on board so no problems there, although all the sweets have gone. The wind picked up in evening to force 5 so we turned the motor off. Unfortunately there were several squall’s on the horizon, one which got us. 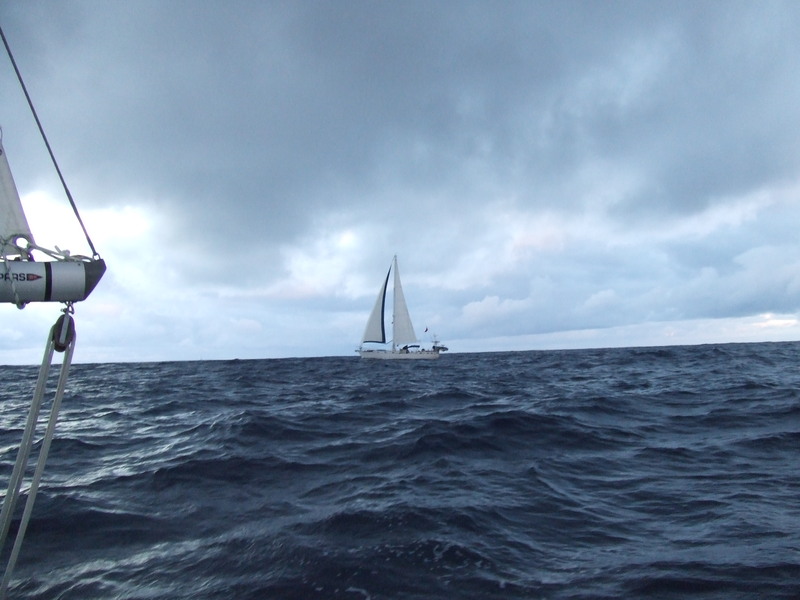 We put two reefs in the main and Genoa and ran slightly off course but at least we were making progress. The swell picked up and left us with an uncomfortable sea state. It was going to be a long night. Neither of us could sleep through the night so sat in the cockpit with the Hydrovane making light work of the steering. We are both shattered and still have 200 plus miles to go before we reach Porto Santo. We saw a few tankers in the evening one which past behind us at around 2 miles off. The rest of the night was uneventful. We both managed to get an hour rest but the motion of the sea is now unbearable. The sails constantly flog. Both of us went back to bed until 10:00 by which time the wind had veered to the East. We shook the reefs out of the main and polled out the Genoa, which settled the boat some what. 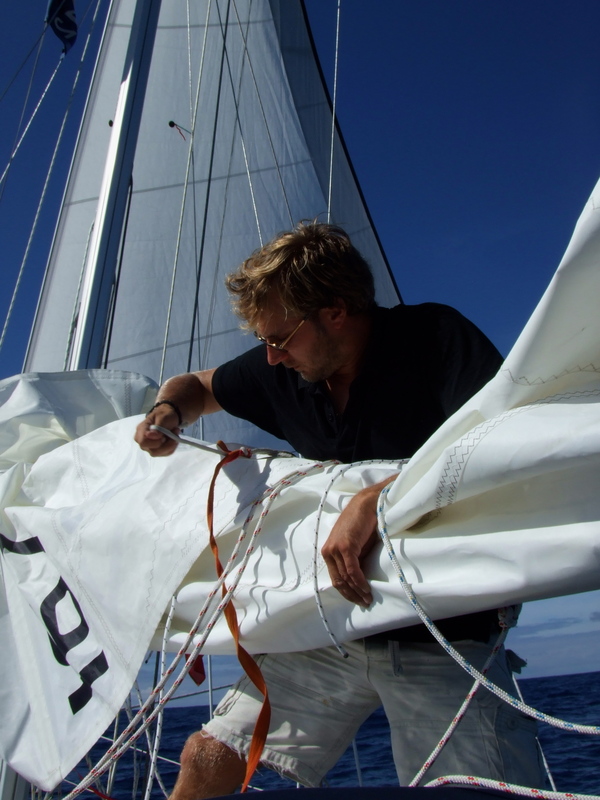 At around 11:00 the wind came from the South, so pole down and we set a broad reach doing around 4.5 knots. If we can maintain this today we may make Porto Santo by tomorrow evening. It is now 13:00 and we have covered 319 miles so only 170 left to go. 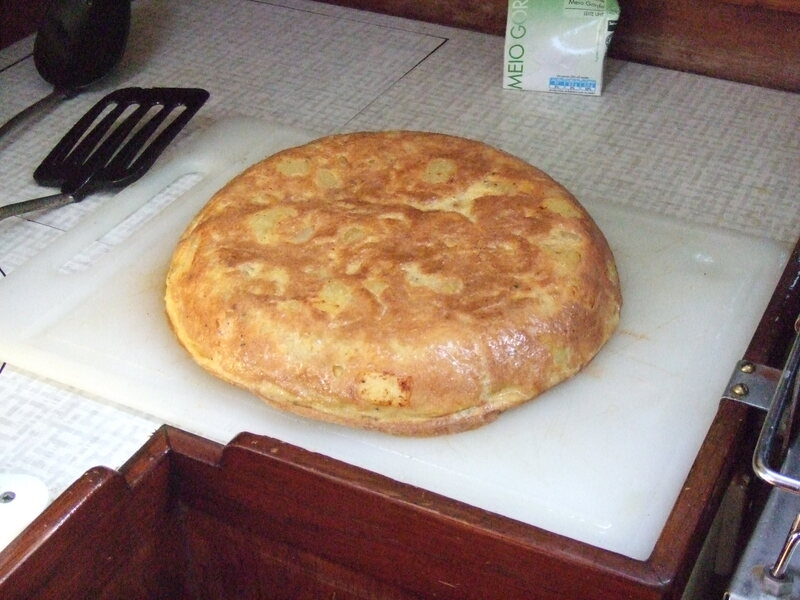 I cooked an amazing tortilla de patata that was supplemented by a salad made by Carlotta. The rest of the day was uneventful. We are still making slow progress but at least we are sailing. We managed to sail slowly though the night with not much occurring but for a couple of tankers. Whilst writing this it is 01:00 on the 17th October and I can see the loom of Madeira, which is now only 45 miles away. Back to the day in question. As the days increase they also seem to become shorter. Our day-light hours are becoming short-lived but the night still seems to drag. This is the same for today. I woke up to do the dawn shift and Carlotta woke at 10:00. 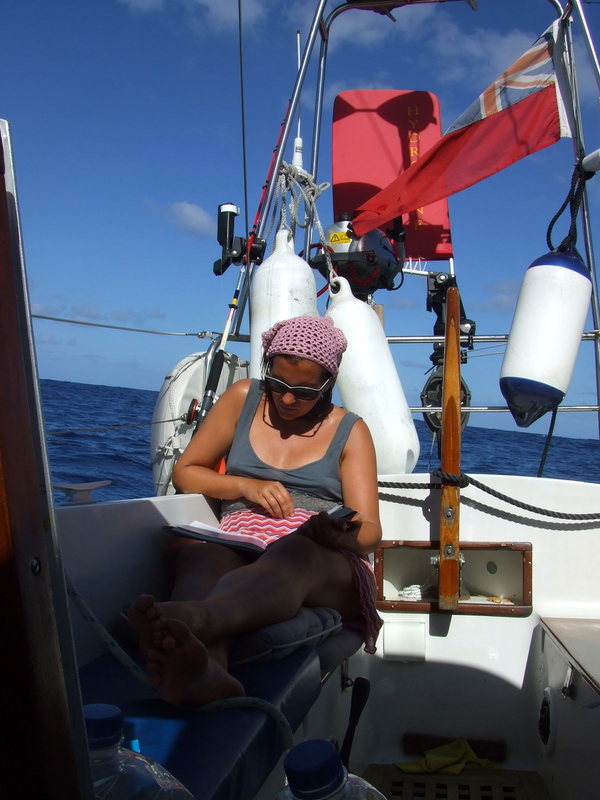 We were motoring but Carlotta felt there was enough wind to sail, which we did. I woke up at 13:00 after 2 hours sleep and again we were becalmed. 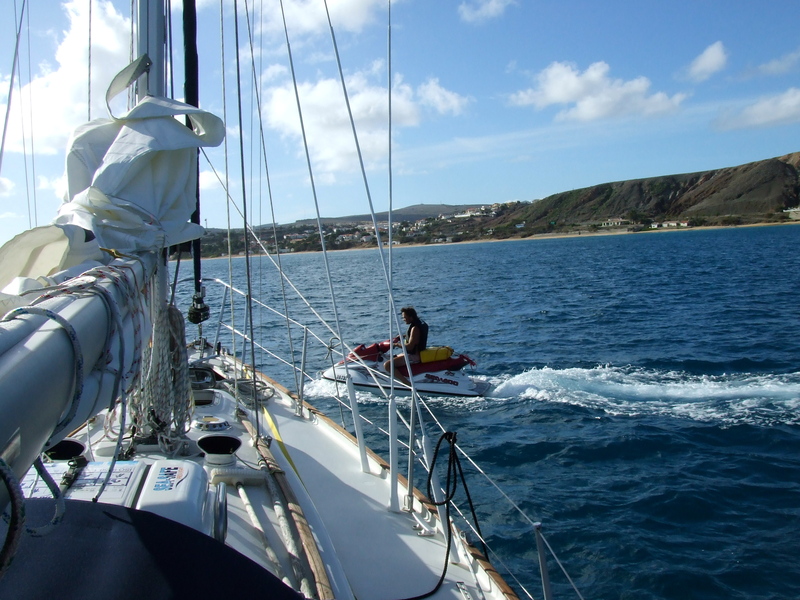 We took down the main and drifted for an hour just enjoying the silence but after a review of how many miles we had to do and what time we would expect to get into Porto Santo, we decided to motor. I cooked another tortilla but this time with onions. We have motored now for the past 11 hours. When we make Porto Santo I will only have 15 litres of fuel left in the tank if that so I am hoping we pick up some wind in the early hours of the morning. All calculations seem to say we have enough but it is still a concern. The electrics are playing up again and now as soon as we switch the galley light on some of the instruments are going down. A fuse that has being giving me concern is still quite hot under load so we are trying to use the bare minimum of our electrical appliances to stop it from burning out. I have made a decision to have the main fuses and control panel replaced in Gran Canaria as we cannot cross the Atlantic worrying about the electrics going down. If anyone knows someone based in the Canaries that can help please send me a comment. We expect to be in Porto Santo by 11:00 today all being well. It has not been the best journey with less wind than forecasted and a swell that has made life pretty uncomfortable. At least no-body can hear Carlotta shout and swear out here. We are both looking forward to showers as I have not changed clothes since we left Cascais and Carlotta is getting frustrated. This was going to be a challenging day, but after I had finished my shift leaving Carlotta with the loom of Funchal in the distance I had no idea what to expect. I managed to get some sleep but Carlotta took over the 02:00 to 06:00 shift under motor as the wind had not picked up as expected. In the morning I could clearly see Porto Santo. It is quite a feeling to see land after days of endless see and sky. It was 09:30, I had tried to sail with a bit of breeze but needed the engine. At 09:40 the worst happened and the revs started to decrease. I rushed to turn the engine off before we ran it dry. My worries were confirmed – we had run out of fuel. Carlotta was now awake and we decided what to do. The wind had picked up so at least we were able to sail. 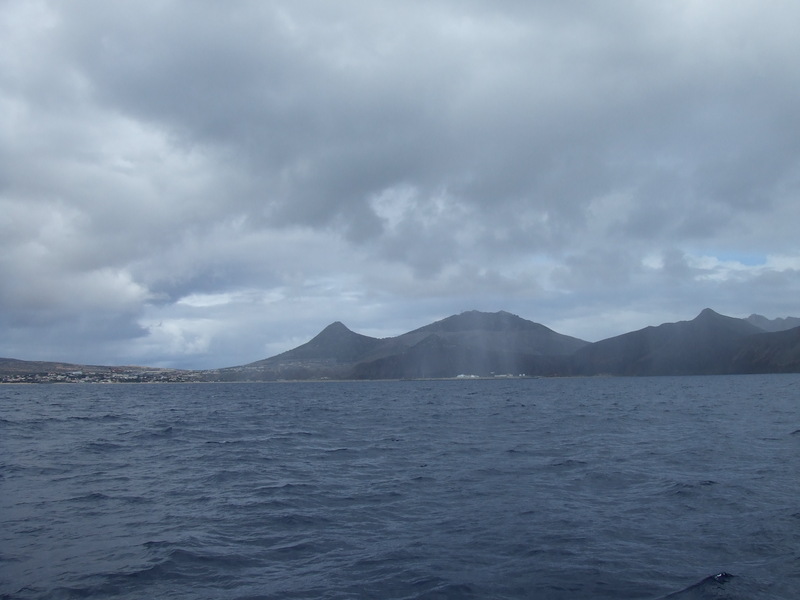 We tried several times to contact Porto Santo but to no avail; we were now 8 miles from the marina. We constantly tried to raise assistance and get a tow but no answer. Luckily for us another yacht (Lone Rival) heard our pleas and said that he would speak to the office. Thank fully our the children of Yacht Rafiki were in the office the same time as Lome Rival and knew that it was us who were in trouble. We were advised to sail into the anchorage but of course two squalls decided to roll down the maintains making tacking under such conditions a complete struggle, not to mention loosing complete visibility. 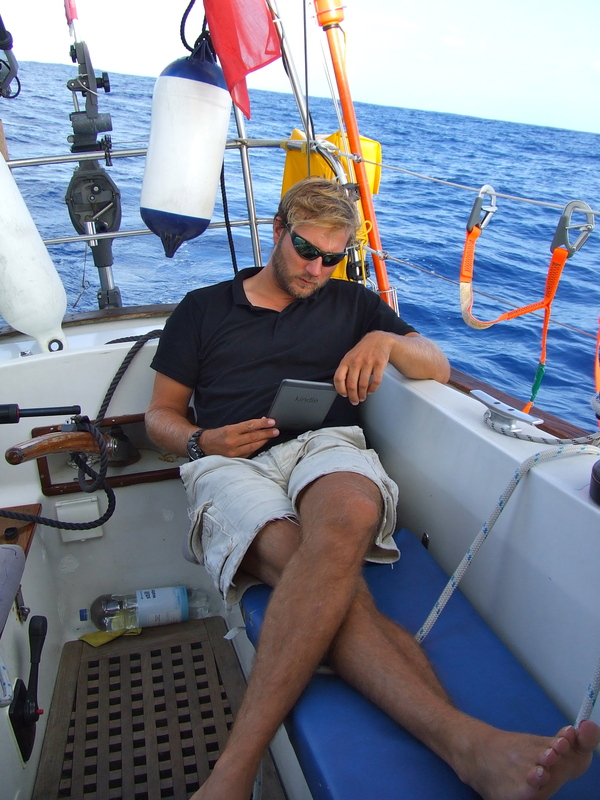 I bled the fuel system and we were back under way, making it into Porto Santo marina by 18:00. Apparently the marina staff radio was faulty but there was no apology for not being able to assist and it actually set the scene for complete incompetence on numerous occasions by certain members of the staff. 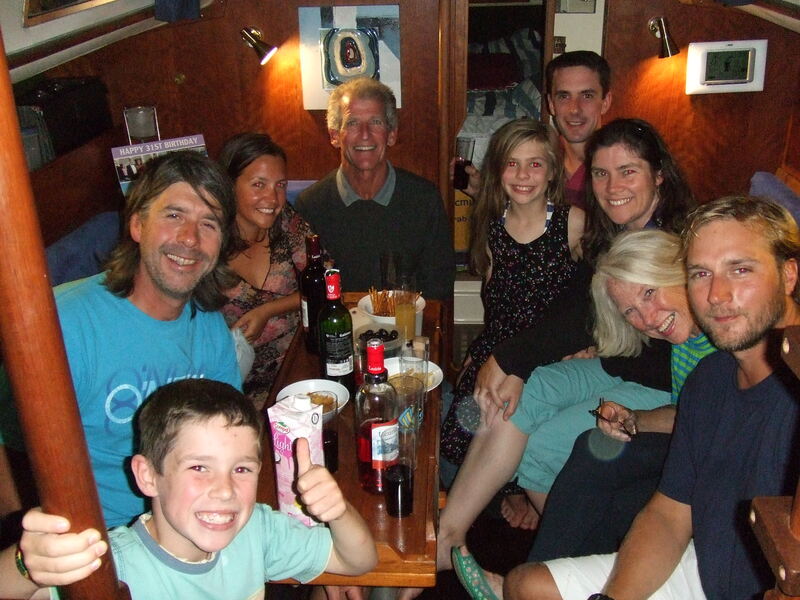 We invited all our helpers over for drinks the next night as a thank you for recusing us, we had 10 on board in total and had a fantastic night, although drunk too much. After being here for 3 days we have found another two boats that also ran out of fuel and needed rescuing, which made us feel better. It was great to also our friends from Yacht Limbo, who sailed across a day later than us in their 26 foot yacht and were unfortunately subjected to horrendous conditions. The facilities and staff here are poor, but it is only 16 Euros a night with an ARC discount so we will stay here for the next few days as another storm will be passing through here on Monday and Tuesday. The help we received from fellow cruisers has been amazing. There is such a fantastic group of boats here and quite a community. We were asked to move our boat during heavy winds to another berth that was smaller as the marina staff obviously wanted to look like they were doing something. We had 10 other people standing by to assist us during the process. 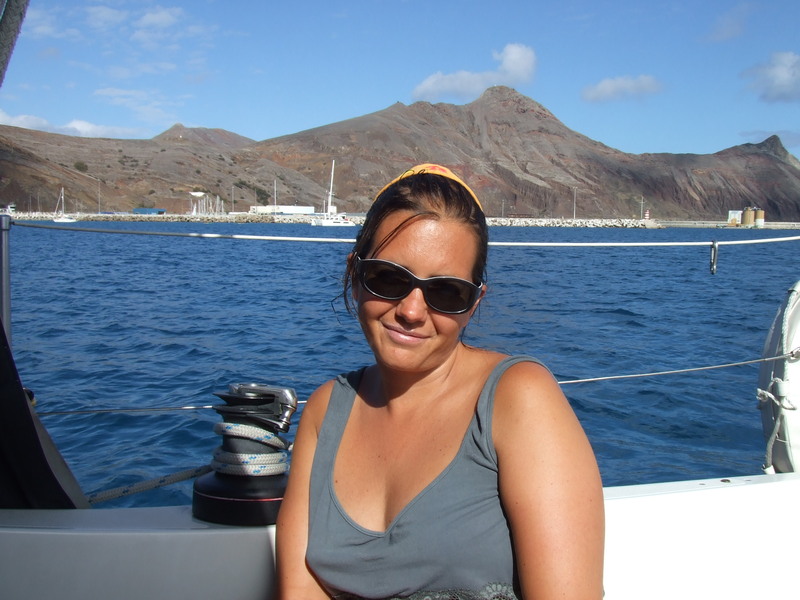 We will depart Porto Santo and sail the 40 miles to the main island of Madeira where we will spend 2 days. There is said to be an out-break of Denghe Fever in Funchal so we will miss that port for now. We will then complete the 300 miles to Las Palmas in order to get our electrics looked at. Always carry enough fuel to be able to motor the entire journey. We left one Jerry Can empty as we though we were heading to Morocco. 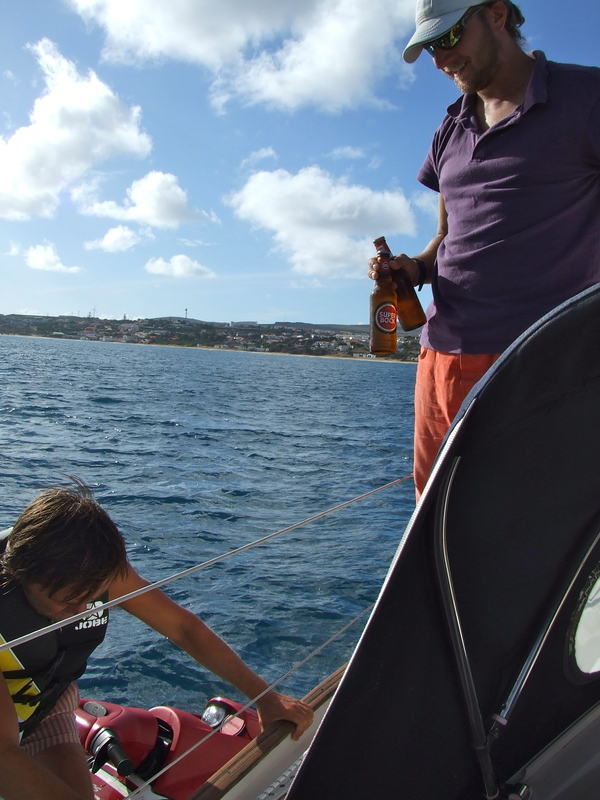 This extra 20 litres would have been more than enough to get us safely into Porto Santo. I always believe that keeping weight to a minimum is good but I will never again leave an empty can of fuel without of filling it. 4 hour watches worked really well with snoozing during the day. Thank you Mark, Heather & Jess for your comments. Every time we hear a sail banging I imagine £20 flying out to sea. We have perfected going down below but I still bang my head on the spray hood when heading down. We hope you are well and Carlotta loved the comment. I am sure we will all share a drink in the future. Well done gang!!!!! Very kind of you not to deplete the Atlantic fish stocks 🙂 Enjoy Madeira.